Superman is a perfect example of a contemporary mythical hero. No other character better exemplifies myth as paradigm: a mythical model that embodies the cultural reality of an era. As such, we can retrace Superman’s origin and development into a synergy that evolved between the creators of the Man of Steel, the history of the US during the post-war period, and the fans who bought the comic books and made Superman an American icon. In 1934 the US was in the midst of the Great Depression and the Nazis were in power in Germany. Joe Shuster, who moved from Canada to Cleveland, met his long lost cousin Jerry Siegel when he was 16. They immediately became close friends as they both shared a passion for science-fiction and comic books. Flash Gordon and Little Nemo were their favorites. Both were Jewish, shy and wore glasses. Joe had already published several cartoon illustrations in his Junior High School paper, while Jerry had published Cosmic Stories at 14. The same year they met, Siegel came up with the idea of a strongman for a comic hero depicted by Shuster in flamboyant cape and red tights. The story would evolve around an otherworldly alien with an earthly identity of a mild-mannered reporter pursuing unattainable Lois Lane who in turn was in love with the inaccessible Man of Steel. Thus creating the most famous love triangle in American folklore. The name for their character came from the German philosopher Frederich Nietzsche’s book Thus Spoke Zarathustra in which he introduces the concept of Superman. The great-souled hero who transcends the enslavement of Christian morality by his will to power. The original model for the character was based on the actor Douglas Fairbanks Senior. Both Siegel and Shuster loved the movies he played in, especially The Mark of Zorro and Robin Hood. The actor’s stance was used as a model for the drawings of Superman. The pose now famous is that of the hero who stands with his hands on his hips and his feet apart. On the other hand the model for the diminutive reporter Clark Kent was that of Harold Lloyd. When Siegel and Shuster came up with the idea of Superman, neither knew that it would take another four years before they would see their hero published in a comic book. In 1938, after years of rejection, they finally sold the first 13 pages of Superman for $130 to National Allied Publications. Unfortunately, they unwittingly signed a release form relinquishing all rights to their character. Suddenly Superman was no longer their property. As a result, they had to work for the publishing company to produce the character they created. 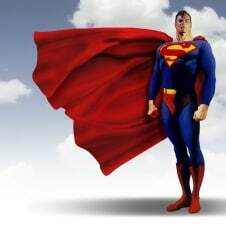 A few years later Superman became the most popular comic book hero in America. Like every mythical hero Superman has a super-natural origin. The story is that of a star-child placed by his parents on a small rocket and shipped across millions of light-years to earth as the only survivor of a wonderful race on the eve the planet Krypton’s destruction. The baby finally lands in a Midwestern corn field. He is found by Jonathan and Martha Kent who raise the child like their own son. They soon find out that Clark is no ordinary being. Superman’s original name on Krypton was Kal-El and his father’s was Jor-El. The suffix of both names has a biblical significance. One of the oldest Semitic appellatives of God is “el”. The designation has been widely used in ancient Israel. It can be found in words like Isra-el, Ishma-el, Samu-el, Gabri-el, Micha-el, etc… Michael is also the mythical warrior angel who opposed Satan i.e., the “adversary”. As such he is Superman’s biblical alter ego. Another biblical analogy that springs to mind is that of Moses’ early days. He too was saved by his parents from the murderous hands of the Pharaoh who had ordered to kill all the Hebrew newborn males. Moses’ mother put him in a watertight reed basket and set him afloat on the Nile. The child was found by the Pharaoh’s daughter who was bathing in the river nearby. She recognized him as one of the Hebrew children and adopted him. Moses grew up in the royal court and he too shared a double identity: as an Egyptian prince and as the great liberator of the Jewish people. With so much Jewish symbolism inherent in the character it is reported that Joseph Goebbles, the Nazi Minister of Propaganda, branding a comic book in his hand during a cabinet meeting, furiously denounced Superman as a Jew. What Goebbels did not understand is that the core of Superman’s persona is that of the immigrant: an alien coming from another place. So Goebbels ended up antagonizing not only Jews, like Siegel and Shuster, but all Americans. Because, with the exception of the aboriginal inhabitants, every American was an alien at one point or another. In the early issues of Superman the hero was seen leaping tall buildings. A few years later he began to fly. As cars and airplanes became popular means of transportation it increased the overall mobility of the American people. As American’s mobility increased so did Superman’s. Through the years his powers increased until Superman became a godlike figure which also matched the US’ status as the world’s military super-power. Accordingly, Superman’s most singular trait is that of his dual personality. One part relates to his super-natural powers and the other to the profane reality of the everyday world; a yin and yang so to speak. The first symbolizes the ideals of individual freedom and power. A stark contrast to the limits imposed by the reality of everyday life as portrayed by the humble Clark Kent. Such a contrast between the super-natural powers of Superman and the ordinariness of Clark Kent depicts the essence of human spiritual ambiguity. Don’t we all at times live in a fantasy world but soon are awakened from our dreams and have to come down and live on earth like Clark Kent. Our hero’s duality also represents the full potential inherent in all human beings. This duality depicts the yin and yang of human spirituality: a dynamic present in many world religions. A good illustration of this duality would be Jesus Christ, characterized by the interaction between Christ the Son of God as the sacred, and Jesus the son of Mary as the profane. Such duality is at the core of the Christian religious experience. In the Incarnation he is both God and man, he is ONE God. In other words, both the sacred and the profane blend into ONE spiritual reality. For Superman and Clark Kent it is ONE animation as they are different characters yet they are the same person. As we have seen, Superman is more than just a vigilante taking upon himself to rid Metropolis of its criminals. As the prefix super in his name implies he is above the ordinary man: a sacred and inaccessible being that roams the heavens. These godlike qualities represent the super-natural origin that is typical of all mythical heroes. Myth therefore plays a major role in the edification of a cultural model that transcends all cultural and ethnical diversities. As such, the hero fosters an ideal to which all can identify; in this case an American ideal. As a result Superman embodies a civil religion that transcends all other religions. A civil religion that is concerned with the cultural identity and integrity of America. When the Superman TV series first came out, the opening statements for the show were; Truth, Justice and the American Way. As Umberto Eco points out in his essay The Myth of Superman, the hero has an obsession with preserving the status quo. His idea of truth and justice is preserving law and order of the majority. He devotes all his energies to put the criminal element behind bars, especially if they violate private property. As Eco observes, Superman does not use his powers to change the social conditions that breed urban crime, poverty or homelessness. The biggest irony about Superman is that even with all his super-natural powers he could not help his creators fight the legal system. In 1947 Shuster and Siegel were tired of seeing other people making millions from their character. They went to court to regain the rights to their creation and cancel their contract. They also claimed $5 million in lost revenue. However, the court denied their claim to ownership of Superman. In the end the hero that is able to put the most dangerous criminals behind bars, making Metropolis a safer place for everybody, could do nothing against legal injustice. As the story reveals Superman lands in a corn field in the Midwest. His adopted parents are white, Anglo-Saxon and in all likelihood protestant (WASP). The question is, why the Midwest? He could very well have landed in a native, Jewish, Irish, Polish, Italian, or Chinese neighborhood in any of the US’ thriving big cities. The reason is that during the period in which Superman was popular, to be American meant to be white Anglo-American. The movies, the TV shows, the advertising promoted that ideal: the Marlboro Man. It is not surprising then that in the land of the immigrant all US presidents have been WASPs, the only exceptions being John F. Kennedy, he was Irish Catholic, and more recently Barack Obama. Therefore, Superman was a mythical paradigm of an era. A model that promoted the cultural reality of a ruling group during post World War II. But Superman is not the popular character he used to be. That’s because there has been a shift in the cultural reality of US and the world. The planet is no longer ruled by two antagonistic military powers. The development of mass communications has promoted the idea of a multi-facet world. The political trend of the future is not towards centralization but diversification. It is also the exploration of other cultural worlds. That shift is represented by the popularity of the TV show Star Trek, which has been one of the leading end of the century mythical paradigm. The series is more representative of the world’s changing cultural reality. It does not promote the model of a single white- Anglo hero, but that of a multiracial crew. A more contemporary reflection of the cultural reality of the US and the world. Although in the original Star Trek the captain is Anglo-Saxon, in The Next Generation Jean-Luc Picard is French. An additional step toward a truly planetary mythical paradigm.